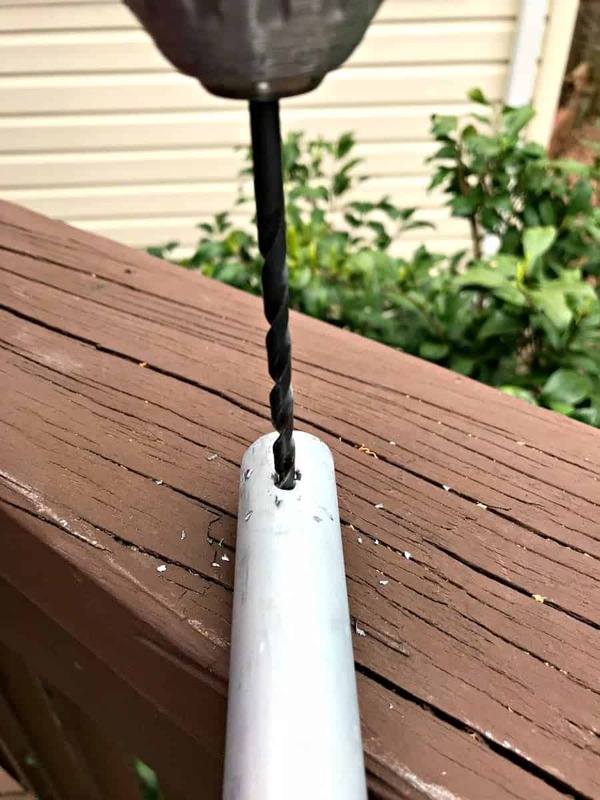 How to easily make your own DIY bird feeder pole from an inexpensive piece of EMT pipe. I’ve been wanting a bird feeder for our back deck ever since we moved into the cottage. The hubs was never interested in having one (he didn’t want to spend $ on a feeder and food) so instead of waiting for him to change his mind, I decided to just go out and get supplies myself. The bird feeder and all of my other supplies were easily found at the hardware store but I wasn’t crazy about the bird feeder poles that they offered. They were all pretty short and skimpy, plus they cost more than I wanted to spend. 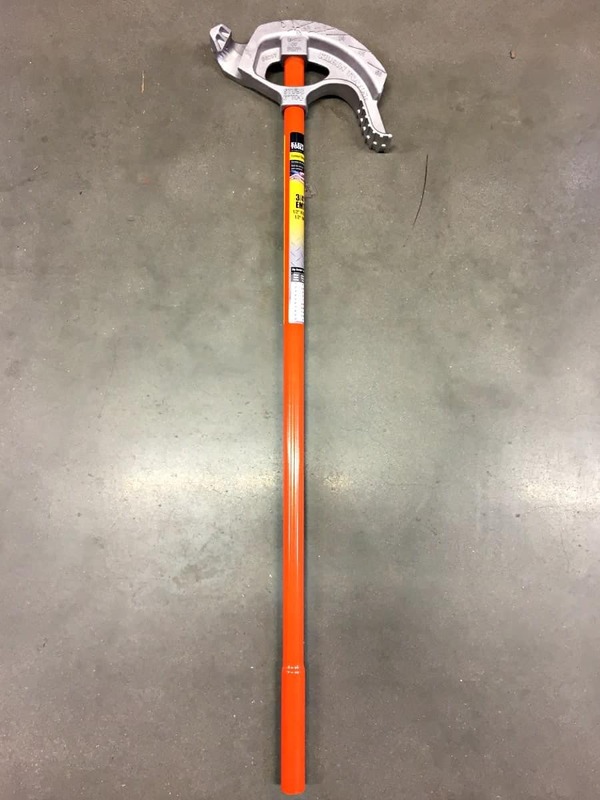 It took me a hot second to decide that I needed to find something else to make my own pole, and spend less money, so I searched the aisles. It didn’t take long to find exactly what I needed in the electrical section, a 10′ piece of ¾” EMT conduit. 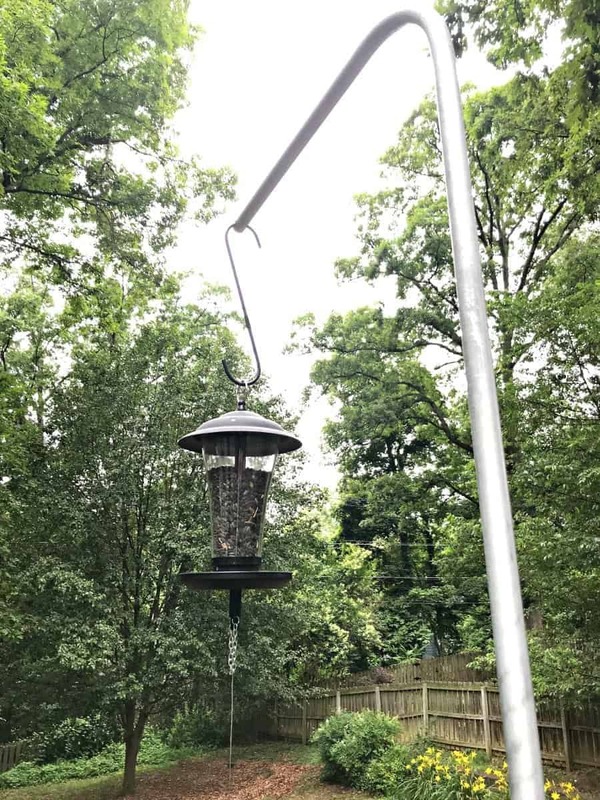 I could make the perfect DIY bird feeder pole with it and it was super affordable at just under $5. One issue though was that the conduit was straight and I needed a bend in it so I could hang my bird feeder. We don’t have a conduit bender at home so I borrowed one from the store and put a quick little bend in it. Once I was home with my new bird feeder and pole, I quickly got to work hanging it. First I drilled a hole in the curved end for my hook. 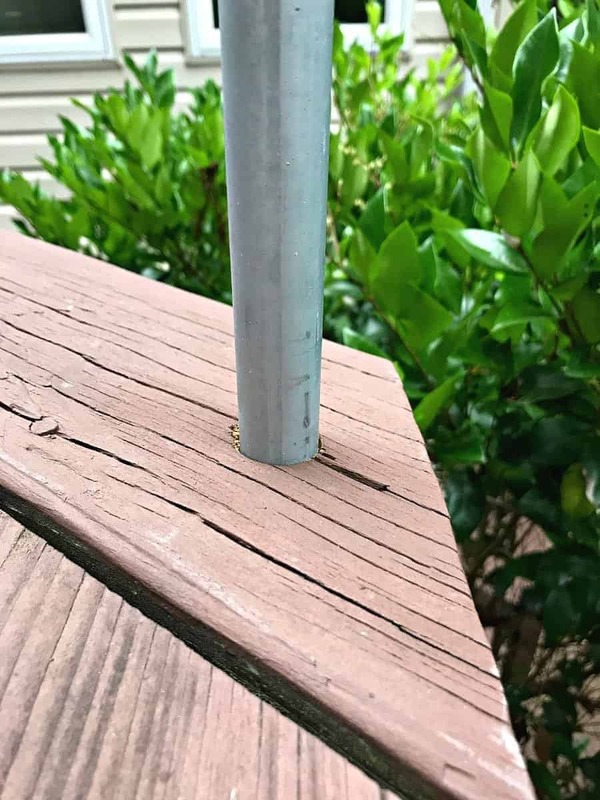 Next, I used a spade bit to drill a hole in the deck railing, making it just large enough to fit the pipe in. I snaked my conduit into the hole and added 2 screws at the bottom to secure it to the deck. I hung the hook in the hole I drilled at the end of the conduit, and hung the filled bird feeder on that. 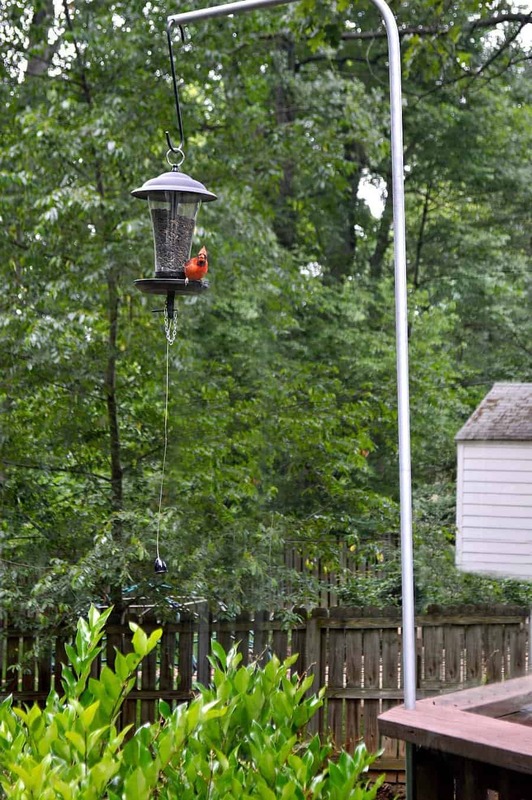 Easy peasy…and less dough than a regular bird feeder pole. Not only was my bird feeder going feed my feathered friends, but I was going to be able to see them up close and right outside our window. I was worried about the birds wanting to come so close to the house but, when I came back to the yard after putting my tools away, I already had a visitor. Less than 5 minutes after it was up! It’s been fun watching all of the different birds come to visit and trying to identify them all. The hubs has also been enjoying it, just like I knew he would. One good thing about this tall pole is that the squirrels have left the bird feeder alone. I caught one looking around one day but they haven’t attempted the climb. Hopefully they’ll stay that way. The rest of the Thrifty Style Team is excited to share their thrifty finds so make sure you check them out. 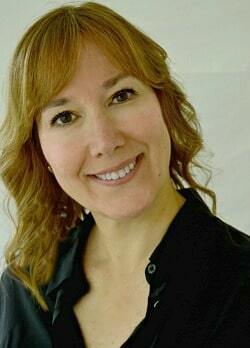 Previous Post: « Chatfield Court is Turning 5 (plus a fun giveaway)! Ran across your post on Pinterest. I know someone else asked about squirrels invading the feeder but the question was asked a couple of months ago just after you installed your new feeder. 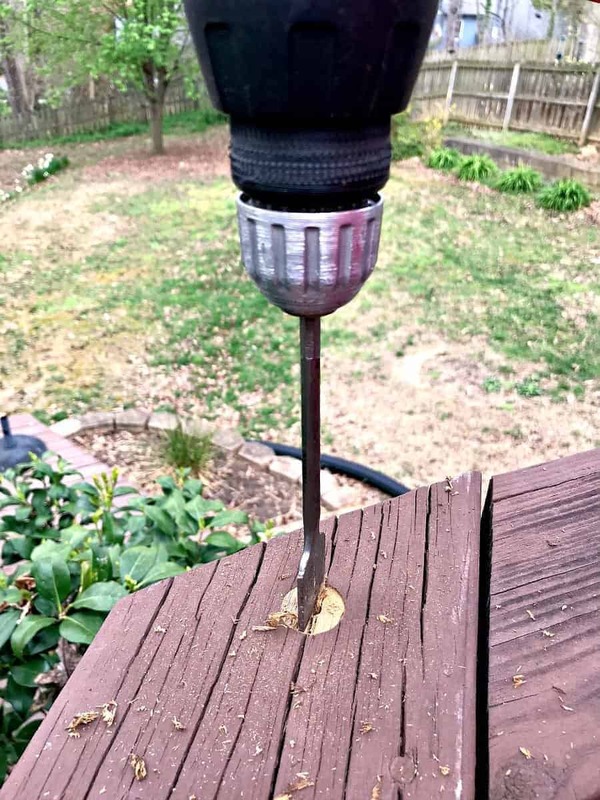 Since the hubby isn’t crazy about the idea of a pole stuck in the middle of the yard so he’d have to mow around, am really considering using your idea but wanted to ask again about the squirrels. Now that a couple of months have passed, have the squirrels been a problem? What an impressive DIY project! You did an incredible job. I love birds. I like to collect bird’s nests. We have a nightingale that sings outside our balcony every night from 8:30 to 5:30 every morning. Thanks so much Meegan. I’ve been enjoying watching the birds come to visit. Now that’s using your nogg’n! Your bird feeder came out awesome! How thrilling to have a visitor right away! In case you have squirrels taking over, my friend swears that adding vegetable oil to the pole will keep the squirrels at bay! They will just slide down. She saw that on YouTube! You’re so crafty. We have tons of birds but no feeders. We used to have kitties and I was afraid to feed the birds. It felt like I was baiting them. Perhaps now we should! Thanks so much Kim! I’m really enjoying sitting in my sunroom and watching the birds. I never thought about cats. We have a lot of neighborhood kitties running around so I’ll have to keep an eye out. Oh my gosh…I love that you were able to capture that sweet Cardinal coming to your bird feeder for a snack! What a great project, too…we’re bird nerds and would love something like this. A really great inexpensive way to feed the birds – and don’t you just love Cardinals??? I have several feeders, and while the squirrels eat more than their share, I’ve decided to not stress about who gets what. I just keep them stocked with bird food and enjoy each and every critter who comes to eat. My birdbath, that I can’t seem to keep filled due to evaporation in the summer, has become the squirrels’ shelled corn feeder, which goes a long way keeping them from the bird feeders. The ground feeders around the spilled-out seeds are also interesting – raccoons, possums, chipmunks and turtle doves, who don’t like to perch on a feeder because they are heavy birds and not very coordinated. I don’t see deer because I have two dogs, but the dogs and the small wild animals have grown to respect each others’ space and I don’t try to control nature, so all are welcome. There are also community cats that I try to keep so well fed that they leave the birds alone and so far have been successful. It’s like my own little non-petting zoo and I love each and every one. I do love the cardinals. They are ruling the roost though and scaring other birds away. I had a beautiful blue jay visit and Mrs. Cardinal went right after him. Haven’t seen him since. Thanks so much MJ, I’m glad you enjoy visiting the other links. You are so creative! What a wonderful DIY. Wow, love your idea for the bird feeder. Watching birds is a relaxing thing to do. Thanks Debbie! I have been enjoying it and find myself checking it often. I just wish I would have put one up sooner. It’s such a good feeling to ‘make’ an item for yourself. Saving a bunch of money is a great plus. I recognize your conduit feeder pole because we have several made just like you did yours. I loved seeing (and reading your post). Nothing better than watching those pretty lil birds eating from a feeder in your own yard; one of my favorite ways to relax! Great minds think alike. 😉 It was such a simple project but it gave me the size pole I needed so I could put the feeder closer to the house. Plus I saved some money. That’s always a good feeling. Thanks so much for stopping by Carol! Love this idea! Watching the birds is always fun. My husband is in charge of filling the feeders all year. I’m happy to let him do that and to watch the birds that come and go.